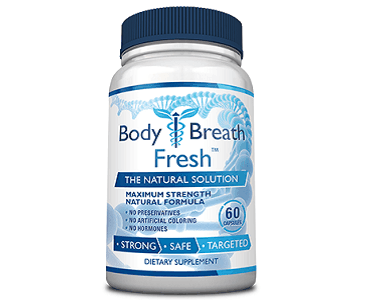 One of the most common causes of bad breath is poor digestion. Other symptoms of a digestive system that is not functioning as it should are bad body odor as well as bloating, a coated tongue, stomach cramps, and diarrhea (or constipation). 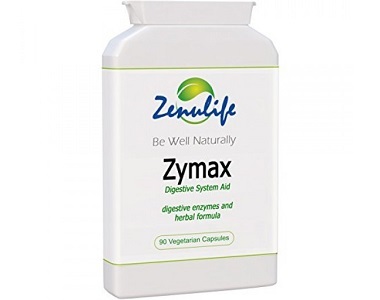 This is our review of Zenulife’s Zymax, a supplement that has been formulated to work as a natural aid to digestion. It contains a host of digestive enzymes that help to break down food in your digestive system, and thus contribute to detoxifying your body, ridding it of undigested foods that linger in the colon and create unwanted bacteria. These are all either plant-derived enzymes or detoxifying herbs that contribute to helping your digestive system to function well. Betaine HCl, Bromelain and Papain are all enzymes that help to break down protein, and thus aid your digestion, while Amylase and Lipase do the same for carbohydrates and fats respectively. Caraway, Fennel seed, ginger, peppermint, and turmeric are all herbs that act in various ways to aid digestion and counteract digestive problems ranging from irritable bowel syndrome and diarrhea to colic cramps. Apple Cider Vinegar, on the other hand, helps to combat constipation as it stimulates your digestive juices that help your body to break down food. How Do You Use Zenulife Zymax? Take one to three Zymax capsules before each main meal for 3 to 4 weeks. Thereafter, you can reduce your dosage to 1 to 2 capsules taken 2 to 3 times a day or as required. There is a warning that you should not exceed the recommended dosage, but there is no clear indication of what this is. If you assume that the main meal is taken 3 times daily and that you can take up to 3 capsules before each main meal, that would indicate that the maximum recommended dosage is 9 capsules – which seems pretty high. 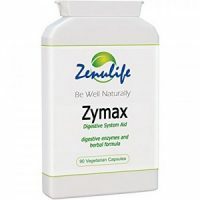 If you purchase Zenulife Zymax directly from the manufacturer, you can expect to pay a reduced price of $29.99, instead of the regular price of $49.00. Zenulife also has a special offer – buy 2 bottles of 90 capsules, and get a third one free. That means you would effectively be paying $60 for 3 bottles. We were unable to find any information about a manufacturer’s guarantee for Zenulife Zymax. This is concerning as it could indicate that the manufacturer is not willing to put its money where its mouth is with regard to the efficacy of this product. Bad breath and body odor are embarrassing conditions that can be difficult to treat. Zenulife Zymax capsules take a usual approach to dealing with this problem by focusing on one potential cause of halitosis – digestive tract problems. That is all well and good if problems with your digestive system are the cause of your bad breath. However, it won’t do you much good if something else is causing your problem. While Zenulife Zymax capsules are manufactured in a Good Manufacturing Protocol (GMP) certified facility, which gives you some assurance as to the quality of the product, we were concerned that this was not backed by a clear manufacturer’s guarantee. We were also concerned that there was no clear indication of what the maximum daily dosage is for this product. There was also no indication of how long it would take before you could expect to see results from taking the capsules.